During the July 24, 2012, close Titan flyby, called T-85, the Cassini spacecraft searched for a glint of sunlight reflecting off a methane lake. 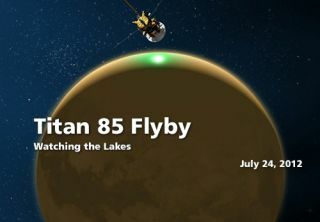 NASA's Cassini probe zipped by Saturn's largest moon Titan on Tuesday (July 24) in a close flyby to search for a lake filled with liquid methane. The Cassini spacecraft flew within 629 miles (1,012 kilometers) of Titan during the flyby in order to "look for a glint of sunlight reflecting off a methane lake," mission managers wrote in a statement. Scientists have dubbed the liquid methane lake Kivu Lacus. It is one of the small northern lakes on Titan and Cassini mission scientists hoped to use the spacecraft's visible and infrared mapping spectrometer (or VIMS) to glean new details about the lake by analyzing its reflected light. In addition to studying Kivu Lacus, Cassini was expected to use the VIMS instrument to observe a huge lake called Punga Mare, the third largest body of liquid on Titan. The spacecraft was also expected to snap new pictures of the Huygens probe landing site so scientists can look for evidence of new geologic changes. These two NASA maps of Titan show the ground track of the Cassini spacecraft over Titan during the July 24, 2012, flyby to search for light glinting off the methane lake Kivus Lacus. The Huygens probe landed on Titan in January 2005 and beamed the first photos ever from the surface of the Saturn moon. The spacecraft was built by the European Space Agency and delivered to Titan by the Cassini probe. During Tuesday's flyby, Cassini whipped by Titan at a speed of about 13,000 mph (20,921 kph). It was 15th Titan flyby of Cassini's current extended mission phase, which is known as the Solstice mission. The Cassini spacecraft launched in 1997 has been studying Saturn and its rings and moons since it arrived in orbit around the planet in 2004. Cassini's primary mission ended in 2008 and it has been extended twice, most recently through 2017. NASA, the European Space Agency and the Italian Space Agency have worked together on the mission.